Indian state has been denying the fact of genocide. Indian media goes hand in hand with the Indian state on this issue. The state and media have coined alternative terms such as ‘Delhi riots’, ‘1984 riots’, ‘anti-Sikh riots’ ‘1984 anti-Sikh riots’ etc. to deny the fact of genocide. Indian Home Minister Rajnath Singh has termed the incidents related to 1984 Sikh genocide as ‘largest mob lynching incident’ in the sub-continent. While responding to a debate in Indian Parliament’s lower house called Lok Sabha on Friday (July 20), Rajnath Singh said: “Mob lynching ki svtantr bharat ke itihas mein sabse badi ghatna agar kabhi hui hai ton 1984 main hui hai” (If there has been any largest incident of mob lynching in the history of independent India, then it was in 1984″). He also referred to former Indian PM Rajiv Gandhi’s statement on November 1984 massacres that when a big tree falls, the earth trembles and asked that how the Congress party could teach BJP on mob lynching issue. 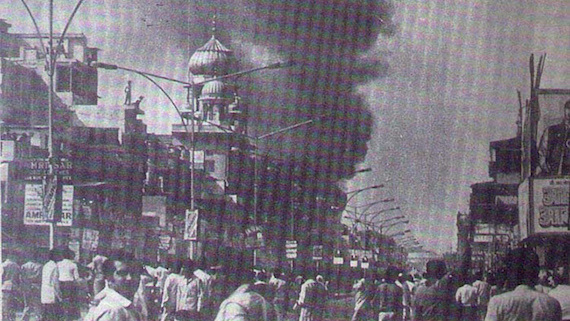 It is notable that the term ‘mob-lynching’ does not imply the planned, organised and systematic nature of violence where as Sikh genocide of 1984 was planned, organised and systematically carried by various organs of Indian establishment, including civil and police administration and the political class. It was proceeded by an organised campaign of propaganda that was led primarily by the Indian media which prepared the ground for this genocide. Genocide studies scholar Prof. Gregory H. Stanton, in his work titled ‘Eight Stages of Genocide’ – prepared after studying various major episodes of genocides across the globe, found that every genocide is followed by denial. In fact he termed denial as eighth and never-ending stage of genocide. Prof. Stanton’s research shows that denial is not limited to simply denying the fact of massacres; rather the perpetrates of genocide restore to various tactics to pursue their agenda of denial. Illustrating commonly used tactics Prof. Stanton said that whenever it is found hard to deny the fact of genocidal massacres, alternative terms are coined to propagate that the massacres do not amount to genocide. Those aiming at denial also adopt a tactic where they condemn the massacres but at the same time deny the fact of genocide by using alternative terms. 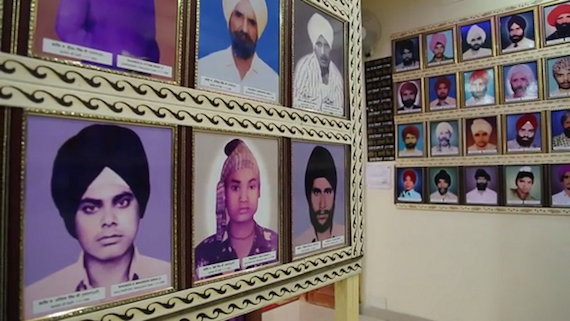 There is no denying to the fact that Sikhs were subjected to genocide in India. There has been a co-ordinated policy of genocide against the Sikhs and it was turned into action in terms of physical extermination of Sikh with Indian army’s attack on Darbar Sahib and other Sikh Gurdwaras in Punjab and adjoining states in June 1984. It was followed by killing spree against Sikh youth carried out by Indian army under the label of so-called ‘operation wood rose’. One of the worst episode of genocidal violence against the Sikhs was carried throughout Indian peninsula in November 1984 in which thousands of Sikhs were burnt alive in four days. The policy of genocide continued with fake encounters, enforced disappearances and secret cremations of Sikhs by Indian security forces till mid-1990s. Independent Reports like Who Are Guilty (People’s Union for Civil Liberties and People’s Union for Democratic Rights), Oppression in Punjab (Citizens For Democracy), ‘Death Silence’ (Asia Watch, now Human Rights Watch), Simmering Embers (Voices For Freedom), Reduced to Ashes (Coordination Committee for Disappeared Persons), Protecting the Killers (Ensaaf & Human Rights Watch) have documented the fact of widespread, organised and systematic human rights abuses by Indian establishment and Indian forces against the Sikhs. The fact of Indian state’s policy of denial is also documented in form of statements of Indian governments’ representatives, Indian politicians and Indian media reports. Despite India’s denial various foreign legislatures and authorities have recognised the fact of Sikh genocide of 1984. Besides various city councils of United States of America (USA), Ontario Provincial Parliament in Canada passed a motion recognising the fact of Sikh Genocide 1984. Recently the state of Connecticut in USA passed a law recognising November 1 as the ‘Sikh Genocide Remembrance Day’. The recognition has not stopped the Indian state from denying the fact of genocide, nor will it. Therefore it is important to identify and counter each any every attempt by Indian state and media which aims at such denial. Rajnath Singh’s statement terming the events related to Sikh Genocide 1984 as ‘largest mob-lynching incidents’ is one also such attempt.